My darling cat Weezie turns one on May 25th. She and I want to celebrate here at Little Things Studio. Most of our friends wouldn’t be able to come to Yazoo City so we are going to have an internet celebration! There will be a BIG sale in my etsy shop that week. 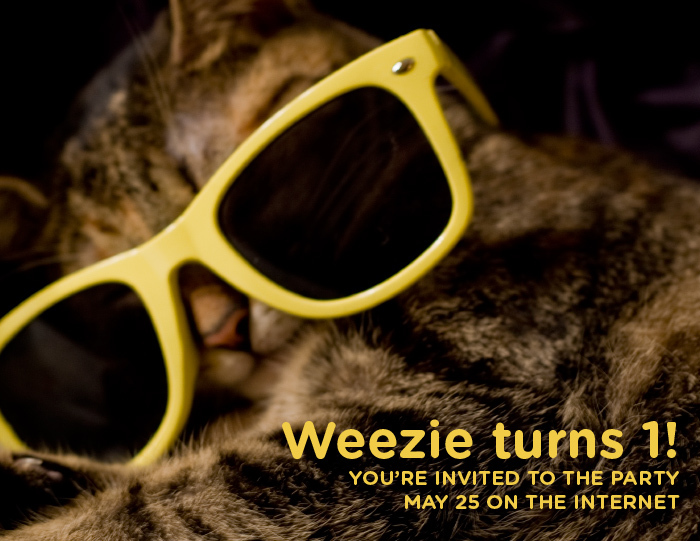 I am asking everyone to send in happy birthdays to Weezie (which can include videos, drawings, poems, photos, ANYTHING. be creative!) You don’t have to know Weezie personally to send her something. Of course it will be featured on Little Things the week of her birthday. Please send in your greeting by May 23rd. And just to make things super fun, the best Happy Birthday get THREE FREE prints of your choice shipped directly to YOU. My cat only turns one once! Gotta go big or go home.